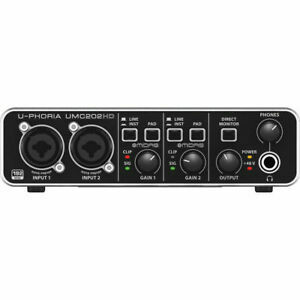 Enjoy amazing sound with the Behringer UMC202HD U-phoria USB Audio Interface with Midas Microphone. No matter whether you're looking for a preamp system for guitars, microphones, or headphones, this one is compatible with them all and is a worthy option. It features 192 khz and is powered from an USB bus. It has two MIDAS-designed microphone preamplifiers that have 48V of Phantom power. 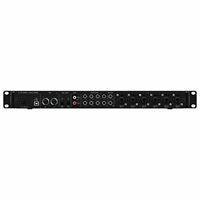 This system also features 24 bit/192kHz resolution and is compatible with most recording software. 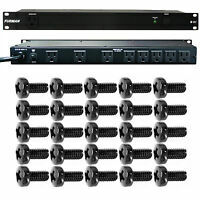 Mic/Line Input Mic/Preamp XLR, Mic/Preamp TRS 1/4", Line TS 1/4"
This thing is excellent hardware at an excellent price. I have been recording via PC for over a decade and have had a number of sound cards and Audio Interfaces. I chose the Behringer U-Phoria UMC202HD as is seemed a good value with good specifications. However it would not function in my SONAR DAW. I wasted time and money on this thing and will not suggest anyone buying one. I started using the U-Phoria UMC202HD and fell in love with it right away. The sound quality and easy to setup (on a Mac) makes it so simple. The indicator lights keeps your recording at its best. The buttons and nobs feels high quality and gives you more precise. The connection is fantastic. 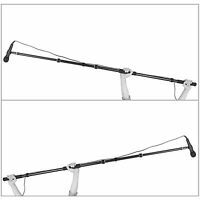 I am going to say this as everyone that has one said about this product too; it is so sturdy. You feel that this Audio Interphase is the real deal. Grateful that I purchased this one. Pretty decent piece, maybe one or two flaws. You can't go wrong with this little fella, even if you own an audio interface already. 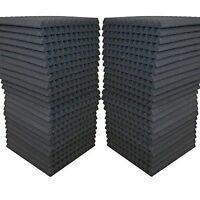 This is a great piece for beginners, small home setups, people on the go, and for back up. Its well built, the knobs are solid, the mic amps are good enough to capture audio. Dedicated headphone volume is good. I think the only thing i didn't like about this piece is that their is no on and off switch, only needed sometimes on that rare occasion when i wake my computer from sleep mode and somehow it looses connection, but it is rare occurrence that happens very few times, most times it works flawless, and the times when it loss connection, i just pull the usb cable out and replug it, which leads me to my only concern, how many times can i do this before the usb port breaks. To avoid this you can reboot your computer.